The Sawyer Bull Roll Pipe Stand is the ultimate tool for fabricators who require a simple, safe, and affordable way to move pipes around the pipe shop, or even from welding bay t shipping dock. All stands are supplied with a 12-inch “V” head, heavy duty polyurethane castors, quick action brakes, and a hold down device as standard. This makes the Bull Roll a fully functioning stand, straight off the pallet. Optional Steel Wheel Heads, Ball Transfer Heads, Rubber Wheel Heads, and SS Heads can be added to the stands to create a versatile range of operations. This unique modular head system makes expensive replacement heads a thing of the past. This system also ensures that all four heads are in contact with the pipe at all times, no matter what size of pipe is being used. All stands are also supplied with a unique bearing system, which allows the stands to be raised or lowered, even when the stands are fully loaded. 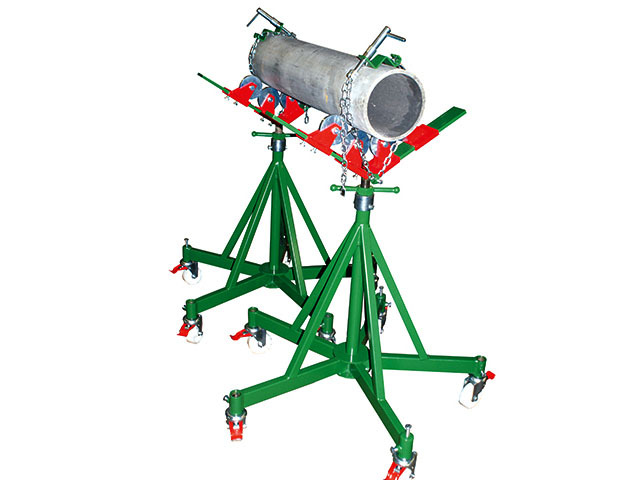 Three fixed and two adjustable castors allow for the stands to be used on uneven surfaces, and as the wheels are fitted with a unique bearing system, adjustments can be made to the castors even when the pipe is fully loaded. If castors are not required, heavy duty plugs to convert the stands can be supplied.